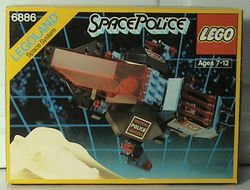 6886 Galactic Peace Keeper is a Space Police I set that was released in 1989. It contains a Space Police ship. It also includes two minifigures: a Space Police officer and a Blacktron astronaut. Just like most of the other Space Police I sets, 6886 Galactic Peace Keeper contains an exchangeable jail cell that was identical to the ones in the other sets. The spacecraft also had two laser guns mounted on expendable arms that were usually hidden beneath the ship's side canopies. These canopy pieces with the Space Police I logo were only available in this set. Part:2468p53 is unique to this set. Part:2468p54 is unique to this set. Facts about "6886 Galactic Peace Keeper"
This page was last edited on 29 April 2016, at 16:12.